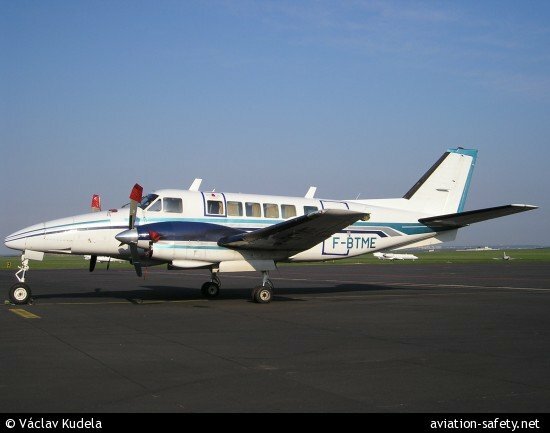 The Portuguese accident investigation board, Gabinete de Prevenção e Investigação de Acidentes com Aeronaves (GPIAA), released the final report of their investigation into the cause of a fatal Beechcraft 99 accident in August 2009 in Portugal. A Beechcraft 99 twin turboprop aircraft, registered F-BTME, was destroyed when it crashed in a residential area of Évora, Portugal. The pilot and one skydiver were killed. The airplane was used for parachute jumping flights. The intention was to climb to 13 000 feet where parachute jumping would be started. When passing about 9500 feet the left engine (#1) flamed out and the respective propeller was automatically feathered. The pilot stopped the climb at around 10500 feet and informed the parachutists that one engine had stopped and they should jump while he would proceed for landing with one engine inoperative. Eleven parachutists jumped, in sequence. One returned to the cockpit and remained on board with the pilot. The pilot started descending for landing on runway 01 at Évora aerodrome (LPEV). He contacted the tower on left base leg for runway 01, but said nothing about the inoperative engine or any assistance required. He was told to report on final, which he never did. He continued the approach for runway 01, with landing gear down and flaps at initial setting (13°), but keeping high speed. The aircraft made a low pass, over the entire runway length, without the wheels touching the ground. After passing runway end it continued flying, the pilot increased power on right engine (#2) and the aircraft started deviating to the left, with wings level and without showing significant climb tendency. The airplane overflew a nearby residential quarter, with a significant bank, until it hit a roof and crashed on the street, upside down, being engulfed in flames immediately. Investigation later revealed that the pilot was only qualified to fly single engine aircraft. Also, he had recently started a company, Avioarte Serviços Aéreos, after purchasing the aircraft in France. The company had no Air Operator Certificate (or Air Work Operator Certificate) and was not registered with Portuguese Civil Aviation Authority (INAC). Primary cause for this accident was pilot inability, as he was not qualified to fly this class of aircraft, to carry a single engine landing or maintain directional control during go-around with one engine inoperative. 4. Inadequate supervision, by the competent authorities, on flying activities carried by pilots and aircrafts with foreign licenses and registrations, inside Portuguese territory.